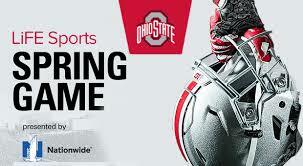 It is about that time again Buckeye Nation–it is time to see what the future has in store for us. The last year of the Barrett Era will usher in a new signal-caller to lead the team and boy, they are loaded at the position this year and the competition will be fierce. In the new era, we will see what a trifecta of talented quarterbacks can do to help the team and more importantly, lead the offense during crucial moments this season. From there most of the Wide Receivers from last season have returned for depending on whichever quarterback wins the job, for a chance to thrive in what could be a more pass-heavy or balanced offensive attack–along with a new starter at Tight End. The O-Line retained all but two starters from last season, but the competition along the line has been another dominant storyline as well. There are many directions that I can go, so let us get down to it. The central focus and one of the most covered stories have been the pending decision for Coach Meyer when choosing J.T. Barrett’s heir. He has a cupboard full of talent and a difficult decision is on the horizon. Each player on the depth chart, minus incoming freshman Matthew Baldwin adds a different dimension to the offense, but they are all talented in their own way. 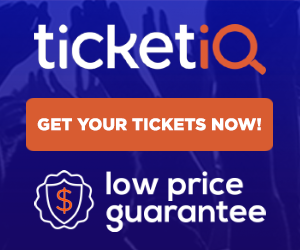 Dwayne Haskins is viewed by many as the obvious choice to lead the team this season after leading Ohio State to another victory against TTUN, and he did it after Barrett left the game with an injury–playing in front of a rowdy Ann Arbor crowd. He iced the game going 6-7 for 94 yards and three rushes for 24 yards, showing that he is ready if they need him and showing his talent to get a leg up on the competition at Quarterback. Joe Burrow was the backup to Barrett, but an unfortunate injury to his hand gave Haskins the nod as the backup while he recovered. Burrow has been on the team a year longer than Haskins, but he is fighting to live out his childhood dream of being the starting Quarterback at Ohio State. While he doesn’t have the arm strength like Haskins does, he is as accurate with his passes. He isn’t as shifty as Martell, but he can move when he needs to do so. Finally, Tate Martell is a bit of a dark horse in this competition because he possesses most of the traits of the previous two players, but he is definitely faster and more shifty runner that is similar to J.T. Barrett. He is also accurate and throws accurate passes downfield. All in all, whoever wins helps the team the most. During the game, they will give the audience a show despite the potential for bad weather, but it will be fun. Either way Coach Meyer goes, the offense will become more balanced. 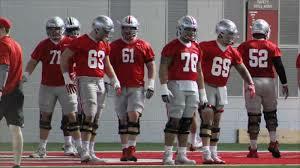 Opposing defenses beware, the Buckeye Offensive Line is developing a mean streak that will serve up pancakes and extra-curricular activity if needed in between plays. 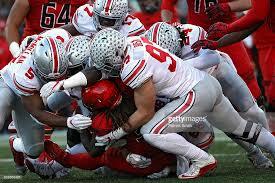 The Buckeyes returned three starters from last season but lost two key players in Jamarco Jones and Billy Price. These losses hurt, but the depth of talent at Ohio State’s disposal cannot be overlooked and the competition is making everyone better. Iron sharpens iron, and there are two starting spots available and 5 for the two-deep. Which two will separate themselves from the rest of the pack and which five will serve as game-ready backups on the depth chart this season? Even though it is just the Spring Game, it will be exciting to see these guys in action. Defensive players, especially at Ohio State lie and wait for their chance to help the team and earn a starting role and this year is no different. This year the Buckeyes lost starters at every level. Sam Hubbard, Tyquan Lewis, Jalyn Holmes, Tracy Sprinkle, Michael Hill, Jerome Baker, Chris Worley, Denzel Ward, Damon Webb and Erick Smith–also featuring a few former walk-on standouts. That is a boatload of positions to replace, but they have the talent to go unscathed. DE’s Nick Bosa and Chase Young along with DT’s B.B. Landers and Dre’Mont Jones will give opposing lines fits. With a talented group of younger players coming in, you will see depth along the defensive line. Linebacker has the most questions, especially after the injury to Tuf Borland. Upperclassmen and the younger players also will make things interesting this Spring and into the Fall. Everyone plays fast at this position, and it is only a matter of time until someone shines like Baker did. Cornerback is pretty much set with Kendall Sheffield, Damon Arnette, and Jeffrey Okudah, but they are searching for a fourth this Spring. With Okudah out with an injury, Marcus Williamson has a chance to get more reps. Shaun Wade is now healthy, and he too will be in the conversation. Safety returns Jordan Fuller but lost Damon Webb to graduation. Isaiah Pryor and Jahsen Wint will compete along with the other underclassmen, which like every position at Ohio State will be a dogfight, but necessary to push each other to get better. For the time being, all we can do is predict until tomorrow morning, but until I see it for myself, it is difficult to get a good feel for what could and could not happen so I will wait until tomorrow to do so. For now, as a fan, I will enjoy it with the rest of you and give my projections based on what I have seen. Go Bucks!